In a fast-growing digital world, service availability requirements are close to 24/7/365 and have the highest priority. Ensuring availability of services that meet SLAs is almost impossible without the proper level of data protection. More than a decade ago, in the era of real-server environments, legacy backup solutions were popular and widely used for data protection. In short, legacy backup solutions are outdated pieces of software that have been developed decades ago and still use agents to protect and recover VMs. This approach has its shortcomings, such as high maintenance costs, too much time spent on administration, too long, or even failed recoveries. Some time ago, virtual and cloud platforms came to market. Almost all vendors nowadays optimize their software and hardware for using it in/with the virtual environment, and modern data centers are already completely virtualized. Many companies have come to understand that virtualization technologies mean more efficient use of resources. Even small companies realize that server resources are wasted, and fast-growing virtualization technologies can replace these physical means and help them solve the problem of limited resources. Therefore, they started to invest in cloud technologies, reliable and smart storages, and virtualization. Thus, it is only a matter of time until enterprises transform their physical infrastructures into completely virtual ones. Legacy backup solutions can hardly cover your virtual environment backup and recovery needs, not to mention cloud technologies. However, virtualization is going to evolve, and you cannot afford to ignore the necessity of backing up your virtual data and meeting RPO and RTO. This is where legacy backup solutions are of no help. This is not an exhaustive list, as there are many more advantages of native backup solutions over legacy backup solutions. 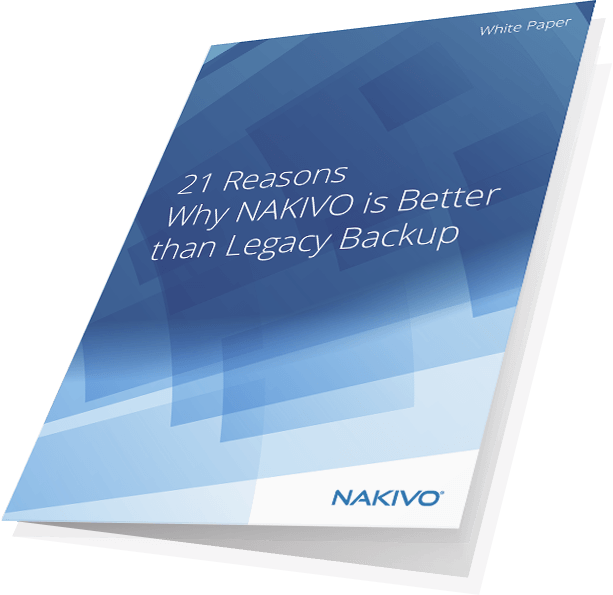 Download our White Paper: 21 Reasons Why NAKIVO is Better than Legacy Backup and learn about the 21 most important reasons why you should switch from your outdated legacy backup solution to NAKIVO Backup & Replication, which is a native backup solution.